Albert ‘Pete” Gurney’s terse and concise 1988 creation is an easy play to stage…simplistic set; no directorial blocking necessities, and the two-person cast has no need of dialogue memorization. Sounds stress-free and comfortable, but to move an audience, as we were last night; the recitation, phrasing and emphasis needs to be faultless. Diane Brokenshire & Chris Reid are consummate thespians and director Yo Mustafa precise enough to make every moment important and rife with meaning. With the exception of a forgivable Act II ‘Oh Oh’ the audience sat spellbound, attentive and silent. The adjective in this column’s headline refers to anything contained in or carried on by letter. It also designates plays such as “La Perfumerie’; “Shop Around the Corner” and most recently, Ephron’s ‘You’ve Got Mail’. The acting duo carry on a half-century of correspondence that reflects their mutual affection and diverging lives; personally interrupted by a brief fling. As staged by West End Studio Theatre, one cannot help but become emotionally involved with the protagonists and sensitively cheer their individual successes as well as bemoan their failures. Critics are people too, and try as we might, sometimes personal biases enter into a column. Acknowledgement; this writer carried on a letter-writing relationship from age 19 until returning from Israel almost two years later. I also benefitted from the almost fraternal friendship with the girl next door. Both young ladies died prematurely and both by their own hand. So, identification with ‘Andrew’ and ‘Melissa’ was inevitable. Admission, there were moments when eyes watered! There is an early scene where Brokenshire’s character fails to reply to three of Reid’s epistles but her facial expressions; even the inclination of her head voluminously express her rationale for non-response. Unless one will be seated in the first rows; bring opera glasses! Both actors possess a faultless sense of timing and even the subtle changes in salutations manage to speak volumes. 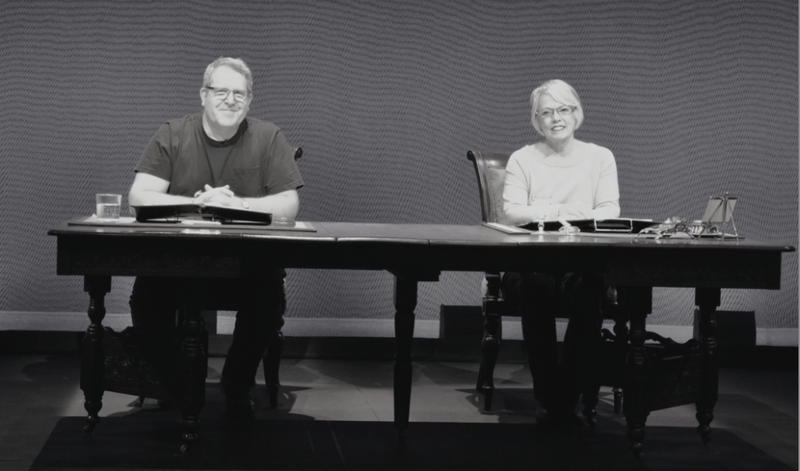 As with the playwright’s ‘Dining Room’, every “I” is not dotted; nor “T”-crossed allowing the audience to construe or interpret the nuances, meaning that attention is highly focused throughout the one hundred or so minutes of on-stage activity. To delve into the plot or its progress would be a ‘spoiler’. Suffice to write, it’s completely realistic; totally conceivable, and it is no wonder than in the early 90’s everybody wanted to perform as either Melissa or Andrew. As word-count padding…some of those who did: – Superman; Jeannie (the Genie); Moses; Mad Max; Barney Miller; “Hutch” & ‘Janet’ from Three’s Company! ‘LOVE LETTERS’ will be at the Oakville Centre until Sunday Jan. 10th. Don’t miss it and don’t forget some tissues or a hankie. “Next Stage Festival”; a Toronto winter treat!